Frodeno emerged shoulder-to-shoulder with Kanute from the 1.9-kilometer ocean swim in 21:52, with Gomez and Brownlee following just seconds after. This made for a very speedy 90 kilometers and a scorching 2:04:30 bike split for Brownlee among the lead group of six athletes. But with a spread of only ten seconds between first and sixth off the bike, it was a race to be decided on the run. 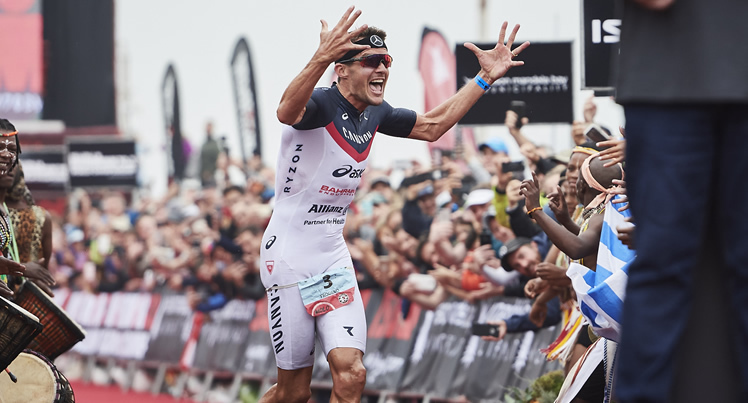 As if Frodeno wanted to prove he could beat Brownlee and Gomez in a foot race, he drew first blood with the faster transition and was first out onto the half marathon run course just ahead of Brownlee. Meanwhile, Gomez had stayed in touch inside the lead group. Once he found his rhythm, he moved into third place with the fastest five-kilometer split, an average of 3:03 minutes per kilometer. Gomez attempted to surge past Frodeno, but the latter refused to let him go. By the 10th kilometer, Frodeno and Gomez were running side-by-side, while Brownlee had dropped off the pace into third. The fierce competition between the athletes produced 10-kilometer splits of 31:24 for Gomez and 31:38 for Frodeno. But Gomez started suffering from cramps, allowing Frodeno to break free of their Iron War-reminiscent run battle. Meanwhile, Brownlee recovered his composure and capitalized on Gomez’s momentary weakness to run into second. But both ran out of road to move further up the leaderboard as Frodeno stopped the clock in 3:36:30 with a sensational 1:06:33 run.